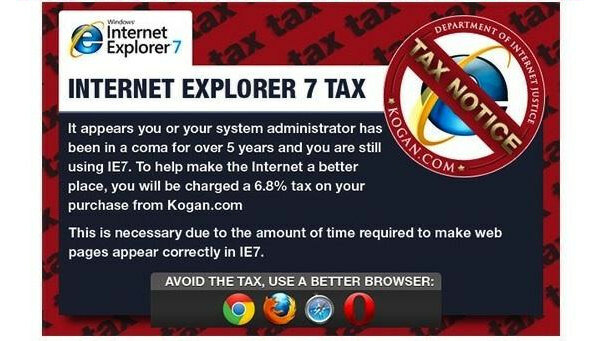 Last month an Australian retailer imposed a tax on purchases made through its website Kogan.com, for customers using Internet Explorer 7. 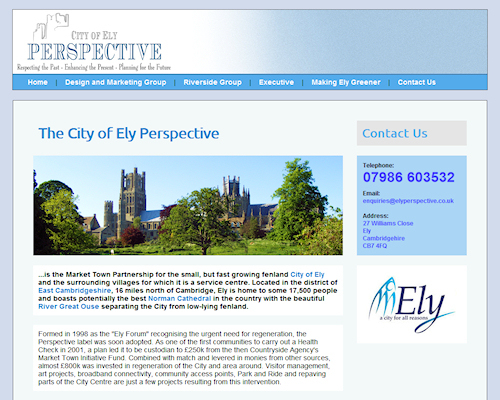 You might have seen it mentioned on news programmes and websites. This was the first widely publicised instance of a website taking punitive action on users accessing their site through an inferior browser. The 6.8% surcharge was implemented to represent the extra work undertaken by the web designer to ensure the website looks as good in IE7 as it does in other browsers. For most people who browse the Internet, whichever browser they have chosen to use, not a second thought is given to how websites appear on the screen. This is largely because the web designer has put a lot of work into ensuring that their website looks the same to the user, whichever browser is used. However, mention the words "Internet Explorer" to most web designers, and they'll probably look at you as if you have something unpleasant on your shoe. Internet Explorer is horrendous to design for. It operates on an almost entirely different set of rules to more friendly browsers like Firefox or Chrome. In recent years fancy new features have been made available (mainly in the form of CSS3 and HTML5) which allow much more scope for visual inventiveness on websites – things like text shadows, rounded corners on boxes, box shadows, gradient filled backgrounds. Not quite so good, is it? Flat, no rounded corners and an entire background has disappeared! Fortunately there are clever tools to fix some of these problems, such as the fabulous CSSPie which makes it fairly straightforward to add the necessary extra commands for IE7 to display the site properly. But even with these lifesaving tools, it's no exaggeration to say that at least 20% of the development time that goes into a website is dedicated to tailoring the site specifically for Internet Explorer users. This is why it's a great idea to introduce a surcharge for viewing a website through IE7. It's not so important to recuperate the extra costs incurred during the design stage, but to encourage people to upgrade their browser. Well, yes and no. In truth, Microsoft have taken steps to improve newer releases of IE (although even IE9 ignores some common rules), and with other browsers such as Firefox and Chrome becoming more popular IE is being forced to move with the times. However, older browsers are still being used by a lot of people - recent statistics (accurate as of 16th July 2012) stated that around 3.10% of users are still using IE7, while 5.92% are on IE6. There are plenty of web designers who would probably be inclined to ignore those users, and force them to upgrade to see websites as they should be. Unfortunately, most clients would not agree with this approach, particularly if their potential customers are likely to reside within the 5.92%! It will be interesting to see if the IE7 tax is merely the first of such ideas from web designers wanting to highlight areas in which they are having to put in extra work. With ever more types of device being used to access websites, and a steady rise in the popularity of smartphones, there is more for a web designer to take into account than ever before. For the next few years it could become common for a web designer to be expected to provide different versions of a website to function specially for PC, smartphone, tablet and smart TV. 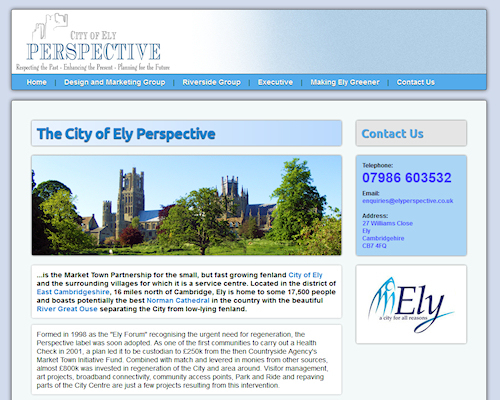 Convincing a client to pay four times for a single website might prove to be a hard sell! Such a informative article it is!! But feel few problem when I read this post Because, after a while my eyes were painful for your white color letter on black background. Superb layouts!! you have created this all layout very nicely, i m impress with your work. Amazing layouts. Your blog is full of information. I really appreciate it. I am daily reader of your articles. Thanks for sharing. I will keep visiting your blogs. Thanks for sharing this very nice and informative blog with us. At a very fast pace, podcasting is making its place in the domain of marketing. Many brands have already adopted it to nurture their customers community. But all of this is only possible with the podcasts which are hosted by great hosts. So what is needed to be a revered podcaster? You should have knowledge regarding this. Your blog is wonderful. It provides me with the information I was searching for. Thank you. Appreciate your efforts for creating such a nice post. Keep up the good work.